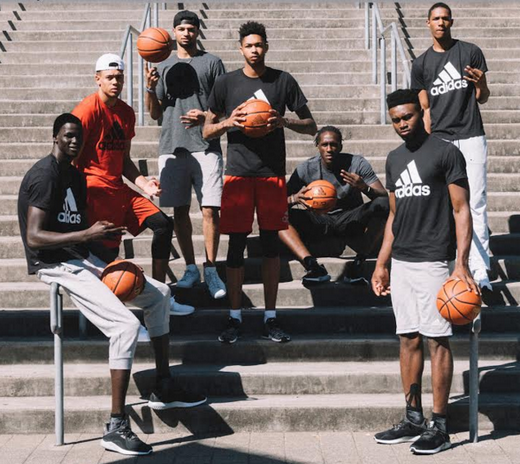 Adding to an already impressive 2016 Rookie Class, adidas Basketball welcomes eight new members to the hoops family. Thon Maker of the Milwaukie Bucks, Taurean Prince of the Atlanta Hawks,Wade Baldwin of the Memphis Grizzlies, DeAndre Bembry of the Atlanta Hawks, Ivica Zubac of the Los Angeles Lakers, Cheick Diallo of the New Orleans Pelicans, Patrick McCaw of the Golden State Warriors and Isaiah Cousins of the Sacramento Kings join the ranks of our initial draft class highlighted by Brandon Ingram of the Los Angeles Lakers, Jaylen Brown of the Boston Celtics, Dragan Bender of the Phoenix Suns, Kris Dunn of the Minnesota Timberwolves andJamal Murray of the Denver Nuggets. Seven of adidas’ newest partners stopped by the adidas Village in Portland, Oregon for a special welcome to the brand. Ingram, Brown, Murray, Maker, Prince, Baldwin and McCaw participated in product feedback sessions, footwear testing and an employee meet-and-greet. The latest three stripe partners will play a collaborative role in driving performance insights to create new footwear and apparel. They will also be featured in upcoming brand campaigns, activations and global tours.